Queensland State Youth Affairs Conference 2014 from Siya Vash on Vimeo. Download the Conference Plenary Outcomes pdf below and watch the Conference Highlights Video. Defending Youth Work in UK and Australia-same same but different! The 2014 State Youth Affairs Conference was held on 21/22 August in Brisbane. Delegates gathered from all regions of Queensland as well as interstate and overseas to share knowledge and explore various issues impacting on young people and the youth sector. Many people felt energised by the presentations, discussions, networking and solidarity on display at the conference. 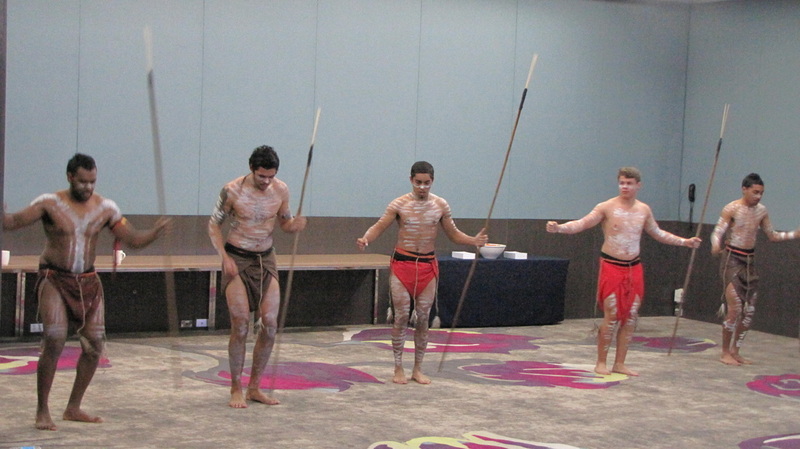 The conference was opened by the Warrajamba Murin Dance Group which grounded the conference by acknowledging the Country and Elders before displaying elements of ancient Murri culture and passing on knowledge. YANQ believes that the Traditional Custodians and primary culture of Australia is Aboriginal. We support the right of Aboriginal and Torres Strait Islander communities to self determination, and recognise their capacity to generate their own solutions to the problems imposed on them by continuing colonisation and ongoing pressures to assimilate. We recognise the proven credentials of Aboriginal Traditional Owners and Custodians in connecting with and managing this Land. We value the wisdom and leadership Aboriginal cultures can bring to addressing the problems faced by Australian society. This was followed by Siyavash Doostkhah, long time YANQ Director, providing a brief history of YANQ going back to late 80’s when youth sector members created YANQ to act as their peak body for Queensland. YANQ was funded and acknowledged as the youth sector peak body in 1992 and successive governments funded YANQ until 2012, when YANQ was defunded by the LNP Government. Governments of both persuasions have always found YANQ’s advocacy work uncomfortable which means YANQ has managed to be a strong voice for the youth sector and in recent years with the capitulation of other state peaks, for the broader community sector. Siyavash also outlined YANQ’s activities since the organisation was defunded two years ago and outlines his personal commitment as well as YANQ’s management to continue the role bestowed on them by the sector since 80’s. Siyavash then introduced Tony Taylor, the conference keynote speaker from UK, long time youth worker, activist and the coordinator of the “In Defence of Youth Work” campaign. Tony also went back in time to the 1980’s and painted a picture of UK and the world more broadly being influenced by the neoconservative market ideology of Margaret Thatcher and her followers. He eloquently described how market ideology has been rammed down the throat of non-government organisations, and how youth work, as a distinctive practice has become under threat. Tony provided a critique of the “Outcomes” agenda which resonated strongly with conference delegates. Tony tackled some very hard issues with great sharpness and a wonderful touch of humour. Tony described the events which led him to write an “open letter to the sector” 5 years ago which was the birth of the “In Defence of Youth Work” campaign. The campaign has been undertaking some amazing strategies including a “Story Telling“ project by youth workers. There were 22 workshops covering 7 streams, perhaps a little to ambitious in trying to have something for everyone as feedback so far has suggested people would like more time in a single workshop with opportunity to break into discussion groups and enhance their learning. Presentations clearly had inspired the conference delegates and the discussions flowed to break times and evening talks and drinks. To pull together everyone’s learning from the whole group sessions. To build a sense of cohesion and common ground across participants. To develop ideas for future action – at both a local and statewide level. Suzi has already provided YANQ with the writeup documentation from the plenary sessions. This will be released on YANQ’s website in the very near future. Handouts and presentations from various workshops will also be released on YANQ’s website. Overall the conference was a chance for youth sector members to engage in some cutting edge discussions about the role of youth work and how best to preserve the work as a distinctive practice. Feedback from delegates also suggests that networking opportunities and skills development through workshop activities were highlights of the two day conference. Discussions are underway at YANQ management level and we are working with our colleagues in the UK to find the best way to advance our mutual interest and ensure the “In Defence of Youth work” campaign which has received an initial warm welcome in Queensland, will permeate the sector across the state and potentially Australia wide. I’ve been an avid part and defender of the community driven youth sector and its allies since the mid-80s and I’m now truly alarmed by the increasing spread of government influence upon our ideologies, our practices, our agendas and dispirited by a convergence of attacks on these impacting at many different levels. In the 80s and 90s the youth and women’s services sectors in particular were forces to be reckoned with, nationally. We had a plethora of peaks (so many that there were even territorial disputes on occasions! ), a robust, diverse and dynamic community sector and a view that encompassed much, much more than the provision of set services as being necessary to overcome the marginalisation and oppression which threatened young people, women or any other dispossessed group, for that matter. Sure, there were many community based agencies and individual practitioners who were more conservative than yours truly but we debated and hotly contested one another’s views and encouraged one another to be able to justify our respective positions from coherent, internally consistent, evidence based positions and in the end we (largely) respected and valued the idea of a diverse, practical, no nonsense sector with the combined aim of improving the lot for those who most mattered – young people. In fact, the strongest imperative back then was for all of us to place young people at the forefront of what we were trying to do and to stay true to their visions, their aspirations and above all to social justice however we saw it for our constituents. An insightful collection of narratives by youth workers has also been compiled by the In Defence of Youth Work group and can be found at These stories contain no simple answers; they don’t highlight success stories and they are not a thinly disguised attempt by individual agencies to crow about their successes and win favours with funders that too many conference presentations, program and promotional materials have become. Nor are they funder orchestrated one-size-fits-all “professional development” resources designed to implement new programs. The IDYW vignettes tell the real stories of contemporary youth work in the UK. They convey the complexity in marginalised young people’s lives and the concomitant requirement for us as practitioners, as advocates for the dispossessed, to remain real about what we are doing to address this. There are two types of youth workers - those on the ground and those who sit in the office. We need the office-sitters to write things up well but they also need to remain true to what’s happening on the ground. The definition emphasises youth rights, empowerment, practical support, youth centered practice (including young people entering into voluntary relationships with service providers), promoting strengths and change, culturally based practice and working ethically. All the youth workers who contributed to the definition were emphatic about their work being “values based”. Murri youth workers decided to endorse the general statement and added statements about respecting and working from accepted cultural protocols, accepting that this may be different to “usual” practice, honouring the different place of family and clan and the expectation that non-Indigenous workers would do their utmost to support Murri colleagues and to work appropriately with young Murris. Despite all this, many of the youth workers I listened to impressed me greatly with their determination to keep on working ethically and on acceptable terms to young people, along with their preparedness and ability to think so clearly about what was essential to include in defining their work and sector. Several years on from this, after massive cuts to youth services by the Queensland NLP government and now the Feds, it is timely to touch base with the definition again. Does it adequately reflect our aspirations as youth workers and for young people? Is there any way of strengthening it to support our remaining NGOs and allies to uphold the qualities, skills and knowledge developed over the past 25+ years which we accept as indispensable in ensuring we can fulfill our purpose: i.e “to resource and support young people who want help to access, navigate and make the best of their life choices.” What can we do as youth workers and what can we request of workers with young people (e.g. diversionary workers, teachers, statutory care workers, etc) to support grass roots youth work? Where do our varied roles intersect and how can we work together to ensure the very things which are most valued by young people about youth work aren’t eroded and replaced by the very things young people mistrust or dislike about other approaches? How can we keep young people in the center of our responses? I’m looking forward to revisiting the state definition of youth work during workshops at the YANQ conference and considering how it may be used to strengthen support for and understanding of Youth Work across Queensland. And I can’t wait to hear more from Tony Taylor about the UK experience and what we Aussies might be able to learn from this. See you on August 21st & 22nd at the YANQ Conference! "Some other agencies work differently to us and do their own thing anyway – they aren’t inclined to listen to anyone else. They get caught up in outcomes and don’t see the value in doing other work with young people. This is particularly the case when you are working with “professionally based” services – they tend to take over and not value local or Murri knowledge." Youth Sector Development is clearly in the spotlight at YANQs upcoming State Youth Worker’s Conference in August, with the number of presenters keen to address this indicating its importance at this critical juncture within youth affairs with increasing pressure to accept funding or service delivery models which are difficult, at best, to implement in ways most acceptable and useful to young people. Each of the three workshop sessions contains at least one presentation addressing macro concerns across our sector, highlighting where we are now, innovative current practice and looking at sector development into the future. Enthusiasts can attend all five! The first afternoon provides an opportunity to hear more about YANQs CPLAN model where regional youth workers posed the question of “what are the issues and how are youth workers and YANQ ensuring the regional voices are heard?” and then sought to answer it. This panel workshop will bring together YANQ’s regional workers who have been working under the name “CPLAN facilitators” to talk about how the CPLAN model has brought workers from across Queensland together and how each region is responding to youth policy and youth sector workforce issues. A new report titled “Building the youth sector from the bottom up, case studies from Queensland CPLAN initiative 2012-2013” will also be launched during the workshop. This report was written by YANQ’s regional workers, edited by Dr Phil Crane from University of Queensland and outlines how each region utilised Participatory Action Research to progress key collective initiatives in each region and across the state. More information can be found at http://www.yanq.org.au/yanq-regional-networks.html. The morning of day two features a presentation by Dr Peter Westoby from the Community Praxis Cooperative and The University of Queensland, called Re-imaging youth work in an Age of Globalising Inequality. The presentation reflects on several years of engagement and research amongst communities (that are mostly young) in the Pacific (Vanuatu and PNG) and Africa (South Africa and Uganda). Peter writes, “In both contexts, reflective of global trends, the growing ‘youth bulge’ is seen as huge potential drivers of economic growth. Proponents argue ‘there is no alternative’ (TINA) to this growth focus. Within this context the call for ‘development’ is mainly focused on foreign investment to create employment for these young people. Within such a frame youth work becomes a practice to prepare young people for such employment, maintaining a system of social reproduction to support capital accumulation. Focusing on alternative development thinking I consider what else youth work might be in such a context”. Dr. Peter Westoby is a senior lecturer in community development at the School of Social Sciences, The University of Queensland; a research associate at the University of the Free State, South Africa; and a director/consultant with Community Praxis Cooperative. Peter has 25 years of experience in youth, community and organisational development in numerous contexts, including Australia, South Africa, Uganda, the Philippines, Vanuatu and PNG. Community Praxis Cooperative is a not-for-profit workers’ cooperative offering professional services relating to community development and youth support, established in 1998 and The University of Queensland (UQ) has an established track record as one of Australia’s leading Universities. This presentation will be followed by Howard Buckley, also from the Community Praxis Co-op addressing What Community Development offers Youth Work Practice. Youth work describes a practice that seeks to improve the lives of young people. It is hard to define as it occurs in many diverse settings with complex variations of young people and the issues they face. Community development offers much to youth work as they are both relational ways of working. This workshop explores the dimensions of a CD framework and applies this lens to youth work practice. Along with his work providing training in community development with Community Praxis Co-op, Howard also manages a Youth Service in Deception Bay. His work experience includes six years as a Social Planner with local government and twenty years in the community sector in a variety of roles including youth work, community work, and sector development. The final presentation in the Sector Development stream is entitled “A university-community partnership: working together to increase placement opportunities for social work and social welfare students” and reports on an Inter-University Student Hub that has resulted from a partnership between Griffith University and Southern Cross University. In recent years the Gold Coast has seen an increase in social work and welfare programs being offered and this has led to increased demand and competition for placements in a field that is already stretched. Griffith and Southern Cross Universities have therefore partnered with each other and with the field to develop a creative solution to this challenge. This paper will describe the rationale for the development and implementation of a Student Hub within a community centre located on the Gold Coast. We will discuss our approach to the project from its inception through to the end of the first semester of students, highlighting the outcomes for the students, for the community centre, local community and for both universities. This paper will comment on implications for practice and we will share our ideas about the sustainability of a Student Hub model. Presenters include Joanne Williams, the Acting Course Convenor of the Postgraduate Social Work Field Education Course at the School of Human Services and Social Work Griffith University, Hilary Gallagher Associate Lecturer in Social Work and Social Welfare and Field Education Coordinator, Southern Cross University and Matt Seaman is President, Silver Bridle Action Group Inc, & Centre Manager, Lynne Richardson Community Centre. One of the streams at this year’s State Youth Affairs Conference is ENGAGING YOUNG PEOPLE. There are 5 workshops included in this stream, including one exploring current realities (Sunshine CPLAN Narratives project), two showcasing innovative youth work (Journey of Pasifika Families from the Pacific to the West and Youth Connect – primary health youth connections project) and two looking at future directions (Innovative Arts-based Youth Engagement Strategies, and Digital Content Production 101). The CPLAN Narratives Project presentation by Howard Buckley looks at how 7 youth agencies across the Moreton Bay/Sunshine Coast region teamed up with 3 Social Science students from the Uni Qld to use a narrative approach to hear the experiences of young people as a central aspect to answering the question of ‘how does youth work make a difference in our region? Hearing and reflecting upon the experiences of the 20 or so young people who chose to be “interviewed” has enabled deeper insight into the issues facing young people and how youth workers make a difference. Participants will be invited to reflect upon this in terms of their own experiences and with a view to making services and supports genuinely accessible and youth centred. If you are keen to hear more about engaging with and supporting young people who have recently arrived in Australia, especially from the Pacific Islands, then we recommend you attend the presentation on the second morning by Kalisi Bese, Inala Youth Service, Pasifika Youth Links Service which highlights the challenges faced by Pacific youth when migrating from the Pacific to the West. Key points Kalisi will address include the population of pacific people, issues, alternatives and recommendations to current responses and what programs and services are currently being implemented in QLD for young people in the “Youth Justice” system. During the sessions held on the second morning, featuring innovative programs, Trish Ferrier will provide a workshop outlining YANQ’s Youth Primary Health Development Project. “Dig Deeper” consultations were undertaken as part of a Youth Primary Health Development Project for the Metro North Brisbane Medicare Local in 2013. The research engaged young people from the Brisbane North region in consultations about their health and issues impacting on them and their friends. Young people from seven different services in the region participated in the research and the workshop presentation will focus on the methodology used to involve them in the research and explain what was learned through this process. The final workshop session includes two workshops by Andrew Gibbs, Creative Director of Human Ventures, a leading social enterprise focussing on applying youth engagement strategies in practical ways. In the Innovative Arts-based Youth Engagement Strategies workshop Andrew will demonstrate strategies for engaging young people in learning through three case studies covering a number of relevant themes. Projects and programs discussed have been carefully selected to represent themes of social justice, collaborative approaches, cultural awareness, and technological solutions as well as showcasing training and development responses. Participants will gain valuable insight into these practical applications of youth engagement strategies and inspired by creative and innovative methods of engaging young people. In Digital Content Production 101 Andrew will demonstrate accessible tools that can be used to produce web ready contact or to create digital stories with young people. In a climate where resources are scarce it is invaluable for individuals and organisations to be able to produce their own content. Andrew will show you how you can create web ready content using mobile devices such as iPads and iPods and some affordable applications. We need to increase our focus on young people’s rights – these have become overshadowed by problems and the focus for funding is on particular concerns or strategies rather than rights. The Law and Justice stream of the upcoming State Youth Affairs Conference will be of particular interest not only to those already working in Youth Justice but those wishing to understand changes to the legal system impacting on young Queenslanders and how best to assist young people to navigate their way through our so-called youth justice system. There are two workshops addressing these themes. “Then and Now – An in depth guide through the changes to the youth justice system and its impact on youth worker practice” is a workshop presented by Katrina Jefferson (Community Legal Education Officer, Youth Advocacy Centre) and Lee Anne Hoyer (Youth Support Advocate, Youth Advocacy Centre) on the first afternoon, as part of the overall session options considering the current realities facing Qld youth workers. These changes will have major impacts on young people in the youth justice system. Those who work with these young people need to be aware of these changes to support their clients before court, at court and in dealing with issues which arise after court. Another opportunity to discuss law and justice related themes is during the workshop sessions held on the final afternoon of the conference when there will be a Q&A style panel discussion exploring legal issues faced by young people and youth workers in the current socio-political circumstances and how we can individually and collectively respond to these issues. Deb Kilroy (OAM, MLB, GDFMenH, GDLPrac, BSocWk), a former prisoner, Principal Lawyer of Kilroy & Callaghan Lawyers and the CEO of Sisters Inside—an independent community organisation in Brisbane, Australia that advocates for the human rights of criminalised women and girls. Assistant Professor in the Faculty of Law, Bond University, Jodie O’Leary, who teaches teaches criminal law and whose recent youth justice research projects have included publications on Juvenile Fitness for Trial in Queensland, Naming Young Offenders: Implications of Research for Reform, and Out of Step and Out of Touch: Queensland’s Youth Justice Amendments. Jodie co-chairs the Law and Justice Institute of Queensland’s Youth Justice Subcommittee. Janet Wight was admitted as a solicitor in England and Wales and then Queensland following her move to Australia. Initially working in private practice in the UK and then Brisbane, her commitment to social justice led her to move into the community legal centre sector. She has been an employee, volunteer and/or Management Committee member with a number of legal centres. She is currently employed as the Director of the Youth Advocacy Centre and since October 2013 she has been President of QAILS, the peak body of Queensland’s community legal centres. This workshop is a must for anyone interested in finding out and doing something about the growing injustice in Queensland. You have to already be totally down and out to get any kind of support these days, or to have a particular need or issue met. People are falling through gaps or having to see too many organisations and most of it happens too late. We are seeing more need for basic, short term, practical things as issues for people – food, clothes, shelter, short term help. It’s more of a financial struggle for young people and their families than it used to be. In the workshop stream “responding to young people in crisis” there are two opportunities during the first afternoon to consider the current realities facing young people and youth workers across Queensland, one relating to abortion access for young women and the second to working with homeless young people. Ashleigh Carrington and Pamela Doherty from Children By Choice will give a presentation exploring why young women may need extra support with an unplanned pregnancy and accessing abortion services. It will showcase the know4sure project, which supports young women to confirm the pregnancy early and access timely health services. Ashleigh and Pamela will also outline the key barriers specific to young women in Qld regarding abortion access and provide recommendations on supporting young women with unplanned pregnancy. Ashleigh has worked in the youth sector for 8 years primarily in the roles of Youth Support Coordinator and in the Get Set For Work program, along with a number of smaller policy and education roles both in the not-for-profit and local government sector. Pamela has been the education and training coordinator with Children by Choice since 2009, delivering both staff development workshops and Children By Choice’s sexuality education program to young people. Children By Choice is a Brisbane-based not-for-profit organisation, committed to providing unbiased information on all unplanned pregnancy options – abortion, adoption and parenting from within a pro-choice and woman-centred approach. Children By Choice provides sexuality education to young people and professional development training along with working to advance Queensland women's reproductive choices, and to improve access to safe and legal abortion. The second workshop in the “responding to young people in crisis” stream is entitled The STAY House Program – “Innovation from Within”and will be presented by Bonita Tyler from the Gold Coast Project for Homeless Youth. It will explore how GCPHY staff identified barriers for young people, preventing them from being able to escape the cycle of homelessness. With no extra funding available, GCPHY found an innovative way to support young people with these barriers through a self-funded program called STAY (Supported Transitional Accommodation for Youth). The results of this project will be presented along with the challenges and learned experiences throughout the duration of this program to date. It will give other organisations an opportunity to see how a project like this could assist them in their service delivery. Bonita Tyler has worked in the Youth Work and Homelessness field in both not-for-profit and local government organisations for 10 years and remains passionate about working with homeless people – especially young people - after doing volunteer work when she completed her Uni degree. Her current role is that of Operations Manager at the Gold Coast Project for Homeless Youth. GPCHY is an Incorporated community organisation formed in 1984 to provide accommodation and support for homeless young people in the Gold Coast Local Government area. GCPHY has become a Specialist Homelessness Service and is funded by the Qld Government Department of Housing and Public Works. [A youth worker is someone] who works with younger people to make sure they are doing okay. It’s like a teacher but it’s not a teacher, because they will help you but they are focusing on you not [just] your scho﻿ol work. Confidentiality makes it more reassuring. If you are keen to find out more about innovative education programs for young people or how to engage young people more in education and training into the future then the following four workshops will be of particular interest. The workshops will be held on the second day of YANQ’s State Youth Affairs Conference and have been timetabled so participants can attend all four if this is their area of specialisation within Youth Work. On the second morning Dorothy Bottrell, and on behalf of Kitty te Riele and Vicky Plows from the College of Education and Victoria Institute Victoria University in Melbourne will share results from a major project about flexible learning programs around Australia, with specific examples for Queensland. Dorothy will show how their research findings can support youth workers looking for a suitable education program, as well as staff who work in such flexible learning settings. The three researchers all work within the field of education and youth studies at Victoria University, Melbourne The researchers also bring to their practice a myriad skills and direct experience in working with young people .This presentation will detail the findings of the Ian Potter Foundation funded project, Putting the jigsaw together, which explored flexible learning options for marginalised young people to complete secondary schooling. This will be followed by a presentation by Jacqui Dean and Janelle Logan from the Supporting Teenagers with Education Mothering and Mentoring (STEMM) program, outlining what this program has to offer young parents, as well as key strategies in establishing partnerships between Education, Queensland Health, Community and Industry. Jacqui is the Founder and Co-ordinator of STEMM and Janelle is currently the Assistant Coordinator of the STEMM Program at Burnside State High School in Nambour. The STEMM Program is a multi-award winning program based at Burnside State High School in Nambour QLD that supports pregnant girls and young mothers in a safe, non-judgemental environment with individual support plans developed by trained case managers. On the second afternoon, the focus of all presentations shifts from innovative current practice to imagining youth work into the future. As part of the Education and Training stream there will be a workshop opportunity to hear about the soon to be launched Building Futures Framework, (collaboratively designed with organisations across the learning sector, including University of Melbourne, Beacon Foundation and Hands On Learning). This workshop will explore the development of an innovative response to measuring the valuable work already being done in the youth sector, with a specific focus on workers and organisations that support young people in learning. It will be presented by Richard O'-Donovan, co-founder and Executive Director of Hands On Learning Australia, and Ani Wierenga, Senior Researcher at Dusseldorp Forum. Collectively, they draw on over forty years’ experience in the youth and education sectors. Richard’s involvement in Building Futures reflects his hopes to support schools as they struggle to avoid being reduced to curriculum accountability services and strive instead to be places that help young people envisage and prepare for their futures. Together, they will discuss with those present, a sector-led response that aims to take charge of evaluation and outcomes measurement, through a framework that is built from the ground-up, based on young people’s and the sector’s own insights. Ultimately this is about recognising respectful relationships at the heart of what makes a difference, and working together to build an evidence base about what really matters. The final workshop in the Education and Training stream is entitled “Second chance schooling: managing the “collateral damage” of current education policies" and will be presented by Martin Mills from the University of Qld (UQ) and Glenda McGregor from Griffith University. It addresses the issue of what happens to young people excluded from school, both through formal and informal processes. Its particular focus is on those young people who have found their way into a ‘second chance’ or flexible school in Queensland and who often come from the most oppressed and marginalised social groups in their respective locations. Glenda and Martin co-authored Re-engaging young people in education: learning from alternative schools and Boys and schooling: Beyond Structural Reform. Martin’s research interests include the sociology of education, social justice in education, alternative schooling, gender and education, school reform and new pedagogies. Glenda’s research interests include sociology of youth, school reform and social justice and education. Both Griffith and UQ have established credentials as two of Australia’s most innovative and influential tertiary institutions. We have had about 8 suicides in the last year, mostly young people and all have been sudden. One minute they were laughing and the next minute they were gone... It’s too common. We’ve become used to it – there’s no more room for grief or we’re numb already. It affects everyone [in a small community] and we’ve needed lots of debriefing and support around it. Issues like this hurt the entire community. So it’s absolutely vital that there are people [youth workers] who sit and be with people, do our best to understand and respect it’s hard to know what to say but are still there doing what we can. I think when I spoke to someone about all the problems I felt a lot better. And I stopped cutting myself. I was down and depressed and now I am really happy because I have had youth workers speaking to me about my problems. The workshops on the second morning of YANQs State Youth Affairs conference include two sessions focussing on health concerns which affect many young Queenslanders and their friends and families. Working with Young People who Self-harm/Self-injure will be presented by Garry King from Griffith University. Garry has extensive experience with working with young people encountering the issues of self harm and suicidal behaviour. Garry has previously worked as the youth welfare consultant for the Australian Institute for Suicide Research and Prevention. He was appointed an adjunct lecturer, youth welfare at the Central Qld University and is the recipient of a Churchill Fellowship to the USA to further research youth suicide. Garry’s workshop will examine the issue of Non-Suicidal Self Injury amongst young people, utilising the latest research from both Australia and overseas to give insights into the issue of Non-Suicidal Self Injury (NSSI). What is Non-Suicidal Self Injury (NSSI)? Who is at risk? What are risk factors? What are protective factors and what is the prevalence of this issue? Further, it will review self harm and suicide for linkages and differences. Working with Young People with masked disability - Rethinking practice, will be presented by Renee Mills and Cate Ryan from Community Living Association (CLA Inc.). CLA Inc. has focussed on building a community inclusive of young people with disabilities and young people at risk Since 1987. Renee Mills and Cate Ryan have worked extensively in the youth sector, undertaking work in the Youth Support Coordinator Initiative and Reconnect Program as well as project work with young people from diverse cultural backgrounds, and their schools and communities. Renee and Cate are committed to working with young people, families and local communities to be connected, informed and active in the pursuit of their goals and continue to find ways to sustain young people focused practice across the north Brisbane region in this time of sector change. Renee and Cate’s workshop will consider what it takes to successfully support young people with cognitive disabilities to engage in systems when the impacts of their disability and consequently, the young people themselves, are often ‘hidden’ and difficult to ‘see’. The workshop will present the nature of cognitive disability and vulnerability in different work contexts, practice principles and service delivery models. Participants will be invited to reflect and discuss practice learnings and the risks for cognitive disability staying hidden in the roll out of the NDIS. "I feel like we’ve become our target group and not used to actually thinking about what we as a sector really want or need... we’ve become too driven over the past decade by imposed methods, funding arrangements, etc. It feels like we’ve got no voice and even if we did we are no longer used to using it." Alarmed by the cuts to youth welfare and services announced in the Federal Budget? Already feeling the pinch from restrictive funding arrangements? Hampered by one-size-fits-all data bases which don’t enable you to document a lot of the “real” work underpinning successful youth work? Unable to enter into genuine dialogue with other workers because you’re all going for the same meagre funding which is available for youth services? Driven by outcomes and targets set by external or seemingly arbitrary measures rather than driven by young people’s rights, needs and circumstances? YANQ believes Youth Work as we know it - a youth-centered, voluntary, vibrant, innovative, flexible, rights based practice - is now in serious danger of extinction. And not only in Queensland but across Australia and internationally, including the UK. The voluntary nature of our relationship with young people has been under threat for some time, with the majority of programs now having conditions attached which essentially force young people and youth workers into mandated relationships (e.g. school attendance or work readiness programs, programs for children and young people in care, diversionary programs, etc). The aims of some of these programs might be great: improved levels of education, learning more life skills, finding employment ... However, forcing young people to participate in programs or services goes against the very essence of the Youth Work Definition developed after extensive consultation with Queensland Youth Workers and adopted by YANQ members in 2013. YANQ warmly invites any workers who are concerned about the ongoing drift from rights based, youth-centered practice and the increasing focus on “outcomes based funding” to our State Youth Affairs Conference, 21 – 22 Aug. There is much we can learn from the UK experience as well as those services still operating according to tried and true principles of youth work and providing “innovative” programs in an increasingly difficult environment, a number of which will be presenting at the Conference. Come along, get reinvigorated, get yarning with others and lets reclaim youth work as the passionate, diverse, “never-a-dull-moment” sector it can be, keeping young people’s rights and circumstances forefront in our intentions and actions. Let’s value, share and continually refine those tools, models and strategies young people continually tell or show us work best for them. Youth workers remain constant with the young people. Government and funding agendas might change so we adapt too but we’re always trying to keep the focus on the young person in a genuine way, not being gammin about it. This is becoming more difficult. A lot depends on who is employed in which jobs - and managers can have a lot of influence - or on what the particular funding bucket is and what other government strategies are impacting on the service or agency at the time. This year promises plenty of opportunities for informal networking and for inputting into the key areas within youth affairs which affect YANQ members and their services. The conference will showcase a range of programs which are continuing to offer high quality services and supports for young people, on young people’s terms. Streams include Defining Youth Work, Youth Sector Development, Engaging Young People, Law & Justice, Responding to Young People in Crisis, Education & Training, and, Health. Often conference participants remark that apart from one or two keynotes or workshops the real highlight for them is meeting up with other delegates or speakers. We’re making room for this. We are also anticipating plenty of strategic thinking will be sought after and synthesised by Suzi Quixley, our MC, and that our plenary sessions will encourage actions to accompany aspirations. Come prepared to share your knowledge and experience with other youth workers as well as gaining from our collective experience. At a macro level, the conference also wants to highlight and stimulate discussion and action around some key areas. How can YANQ or similar peaks work with those agencies and projects still left standing, or being re-created within conservative government agendas, both in Qld and nationally? How can we best ensure young people’s voices are heard, especially given the imminent and savage cuts to youth allowances, increases in student fees and other measures which will have a detrimental impact on the already marginalised in our society and on our streets? How can we input into critical areas of debate including the vacuum created by the de-funding of our national peak, AYAC? What can we learn from interstate and overseas as well as home? As always, YANQ encourages participation by grass roots youth workers at our conferences and workshops – along with young people themselves, it is those workers and services who are there alongside young people, negotiating the systems and providing practical support at a day-to-day level and where possible over time, who understand and show the unique qualities & skills young people expect of “their youth worker” in addition to the many generic ones that ought to be expected of any service provider. 2014 State Youth Affairs Conference. We are extremely excited to announce that Tony Taylor will be our international key note speaker at the forthcoming conference. Tony Taylor has been involved in youth and community work in the United Kingdom for more than four decades. Throughout his career Tony has perceived himself first and foremost as an activist rather than a professional or academic, arguing for the autonomous organisation of workers separate from the employer of whatever ilk. This is reflected in his committed, yet critical relationship with trade unionism. Trained as a teacher, Tony started out as a part-time worker 'sweating profusely in the gym' of a classic youth clubs. He then became a full-time worker in centres and on the streets, before taking up a number of posts in training and development. In hindsight he mistakenly moved into management where he became responsible for Community Education in a rural mining area and then pursuing the thankless role of a Chief Youth and Community Officer in an urban setting. Tony was a leading figure in the transformation of the Community and Youth Service Association [CYSA] into the Community and Youth Workers Union [CYWU], co-writing a radical 'horizontal' constitution which sought to break from the shackles of hierarchy and bureaucracy. Later he became prominent at both a local and national level as part of the National Association of Local Government Officers [NALGO], arguing against a closed craft mentality amongst the youth and community work para-profession. His last paid employment was as a Senior Lecturer at the Manchester Metropolitan University. For the last five years Tony has worked as the voluntary co-ordinator of the In Defence of Youth Work Campaign. Tony has always recognised youth work as a 'contested' space, within which different ideologies seek to influence young people's views of themselves and society. Within this contest he has lined up on the social emancipatory wing of practice, conscious that in his opinion the majority of youth work obeys an agenda of social conformity. However the saving grace, the fixative binding together of these contrasting positions, was the primacy of the voluntary relationship with young people and their inalienable right to walk away without fear of compulsion or sanction. Thirty years ago Youth Work aspired to a special relationship with young people. It wanted to meet young women and men on their terms. It claimed to be 'on their side'. Three decades later Youth Work is close to abandoning this distinctive commitment. Today it accepts the State's terms. It sides with the State's agenda. Youth workers and managers have been coerced and cajoled into embracing the very antithesis of the Youth Work process: predictable and prescribed outcomes. Possessing no vision of a world beyond the present the State has been obsessed with the micro-management of problematic, often demonised youth. Yearning for a generation stamped with the State's seal of approval the government has transformed Youth Work into an agency of behavioural modification. It wishes to confine to the scrapbook of history the idea that Youth Work is volatile and voluntary, creative and collective – an association and conversation without guarantees. Dependent, inevitably, on the tempo and pressures of practice, Tony has sought to put into writing and share his best understanding of what's kicking off in the work. Some of the titles of these efforts will give you a flavour of his concerns. At the forthcoming conference Tony will tell the story, warts and all, of how the Campaign has grown and continues to be a thorn in the side of those within and without youth work and who are relieved to see youth work reduced to no more than a tool of the status quo. – we’re the ones in the background simply getting on with it. The 2014 Qld Youth Affairs Conference on 21st and 22nd August begins with a Welcome to Country by Songwoman Maroochy Barambah of the Turrbal People. After this there will be a keynote from Tony Taylor (for more info on Tony see above) about the UK Youth Work experience, especially in England and the movement he is part of to maintain a voluntary, youth centered practice amidst immense pressure to confine it to narrowly defined, imposed services and supports which largely serve government driven agendas. This includes using narrative approaches both within our interactions with young people and also to capture the essence of what we do as practitioners and of our occupation’s distinctive qualities within the broader youth and community services sector. It appears the UK is also increasingly beset by “outcomes based funding” and changing definitions of youth work, of what might be in young people’s “best interests” and hampered by restrictive evaluation and reporting systems such as RBA (results based accountability). Siyavash Doostkhah, long time YANQ Director will also be giving a keynote, providing background information about YANQs history and current position and updating the sector about broader sector issues. YANQ has worked over the past couple of years without any government funding and Siyavash will also talk about where YANQ is headed. Other key impacts include the recommissioning (reviewing) of the Qld Youth sector, changes to funding guidelines and their implications on youth work practice and State and federal government have made massive cuts to services and have silenced many of the advocacy voices. Meanwhile, young people are increasingly under attack socially, legally and economically and some peak bodies are colluding with government agendas and abdicating their role as advocate. As this goes to print we have learned AYAC (Australian Youth Action Coalition, our national peak for youth work/ers) is another of the many casualties amongst the peak bodies, regulatory and advisory groups and associations defunded since the Federal Coalition Government came into office. YANQ board members will be strategising in the days to come about how best to fill this vacuum and to continue agitating for youth rights and justice, both for young people and the services and workers who support them. We are currently considering possible options and how best to position ourselves, at state, national and potentially international levels to maintain and where possible extend understanding of and respect for young people within the broader community, and support for the services which young people themselves describe as most likely to assist them. Our current position will be conveyed to everyone at the Conference. YANQ encourages our members to contact us if you want to know more about how to strengthen our current position and especially if you or your organisation can actively contribute to our campaign to keep Youth Work alive and well. "Children By Choice" and "Inala Youth Service"